This recipe is adapted from a Cranberry Granola Cookie recipe originally shared with us by Enjoy Life Foods. I tested and updated it quite a bit for a new, but delicious new spin. The resultant cookies aren't too sweet, and perhaps even bridge the snack-dessert divide. Place the applesauce, sugars, oil, and vanilla in a mixing bowl and mix by hand or with a hand mixer until thoroughly combined. In a separate bowl, whisk together the flour, salt, baking soda, and xanthan gum to thoroughly distribute the ingredients. Add the flour blend to your mixing bowl and mix by hand or with a hand mixer for a minute or two to thoroughly combine. This helps the xanthan gum work its magic. Fold in the oats, trail mix, chocolate chips, and cranberries. Let the dough sit while you preheat your oven to 375ºF and line baking sheets with parchment paper or a silicone baking mat. Scoop the dough by the level tablespoon onto your baking sheets. You can leave them as domes, flatten or shape them with slightly damp hands (the dough is sticky!). For bigger cookies, use 2 level tablespoons per cookie and flatten and shape with damp hands. Bake the cookies for 10 to 12 minutes minutes, or until slightly firm and lightly browned around the edges. Let the cookies cool on the baking sheets for 10 minutes before removing them to a wire rack to cool completely. 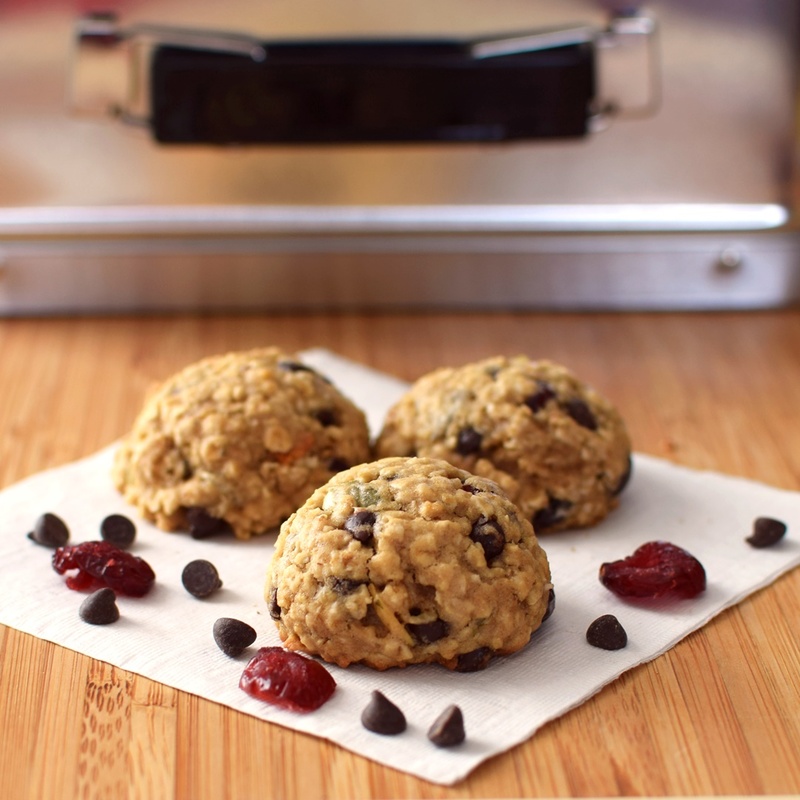 These cranberry chocolate chip oatmeal cookies will keep at room temperature for a few days, and can be frozen. Simply take one (or two) out of the freezer and pop it in a lunch box for a midday treat. If you have excess dough, that also freezes well. Flour Options: You can use 1½ cups white rice flour plus ½ cup tapioca starch for the flour blend. However, if wheat is okay for you, you can swap in all-purpose or whole wheat pastry flour and omit the xanthan gum.